Have you ever heard of taking spirulina for the eyes? If you haven’t then listen up. 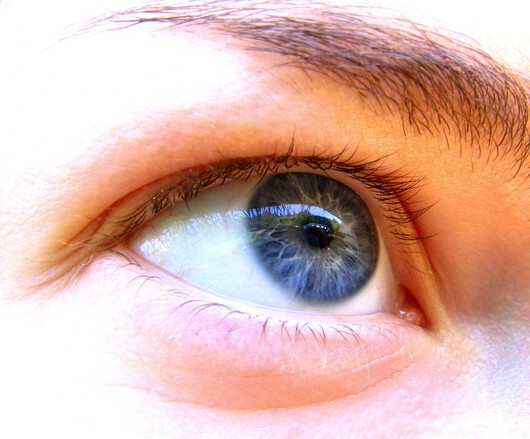 Spirulina can benefit your eye health in many ways, one of the most significant ways comes from its vitamin A content. Spirulina contains around 10 times the beta carotene content than that of carrots, which beta carotene was actually named after. According to the National Institutes of Health, men should have a vitamin A intake of about 3,000 IU daily, and women about 2,300 IU daily. Take a look at what spirulina will provide you with. 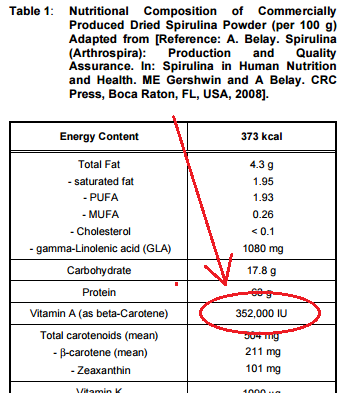 Per 100 grams of spirulina you will get about 352,000 IU of vitamin A. So I don’t think you will need to worry about vitamin A deficiency here. If you are confused by what Beta carotene has to do with vitamin A, here is what you need to know. Beta carotene is converted into Vitamin A in the form of Retinol in the body. So its not actually vitamin A, but its “soon to be” vitamin A. The good thing about consuming Beta carotene instead of ready Vitamin A, is that you cannot overdose. When your body converts Beta carotene into Vitamin A, it only converts the amount that it needs. So it is impossible have excess Vitamin A from this source. And it is toxic to have too much. Vitamin A helps protect the cornea, which is the outer surface of the eye. This is essential for having good vision. If it is not protected it can be easily damaged which could leave you with blurry vision, eye pain (feeling that something is in your eye), eye redness, etc. It is also essential for the retina of the eye to work. It is involved in the conversion of light energy into nerve impulses which happens at the retina. Besides being necessary for retina function, it also helps protect the retina from clump deposits that are known as “vitamin A dimers”. These clumps can lead to complete vision loss in some cases, so protection form them is very important. One of the main problems with synthetic vitamins is that they DON’T work. There are plenty of studies out there that show this. The reason is that many of them are not easily absorbed by the body. Just because some thing “has” nutrients doesn’t mean that those nutrients are absorbed. Spirulina’s beta carotene on the other hand, is easily absorbed by the body, making it a very effective vitamin A supplement. One study that proves, which is published in the Plant Foods for Human Nutrition journal, tested the effects of synthetic vitamin A vs the vitamin A that is able to be produced from the consumption of spirulina. In this study one group of rats was fed synthetic vitamin A, while the other group supplemented spirulina. The results showed that the liver vitamin A concentration in the group that supplemented spirulina was significantly higher than that of the other group . Besides this study others also stand by the conclusion that spirulina is a valuable source of vitamin A. Just to show you how effective spirulina can be for vitamin A supplementation, take a look at this study. It was performed on 5,000 pre-school aged children in Chennai, India. Yes, 5,000. The area it was performed was and still is malnourished and lacking in vitamin A. Over a 5 month period these children were given a very low dose of only 1 gram of spirulina per day. Not much at all, but it worked. The results were very surprising for such a small dose. The vitamin A deficiency was measured by the presense of Bitot’s spots (commonly used to measure this). On average the children’s prevelence of Bitot’s spots decreased from 80% all the way down to only 10% . Thats a huge difference. Its conclusive. Spirulina is a great source of vitamin A. And this is what you need if you want to help out your eyes. You always hear people saying to eat more carrots because they are good for your eyes, but you never hear of anyone saying that about spirulina. This needs to change. Spirulina has a much higher Beta carotene content than carrots, sweet potatoes, you name it. And the Beta carotene is easily absorbed and converted to vitamin A, but not too much. Remember, you cannot overdose on vitamin A through the consumption of Beta carotene. Its impossible. So go out there and improve your corneas and retinas with spirulina. It might be the small fix you need as you are aging and your eyesight is decreasing. I have reviewed top quality spirulina products below, just click on what type you are looking for. Finding high quality and trusted spirulina is essential, due to the effect a bad growing environment can have on it. All of my reviewed products come from trustworthy and credible sources. 1) Spirulina as a source of vitamin A. Plant Foods Hum Nutr. 1991 Apr;41(2):125-34. 2) Spirulina can increase total-body vitamin A stores of Chinese school-age children as determined by a paired isotope dilution technique. J Nutr Sci. 2012; 1: e19. PrevSpirulina for HIV – Best natural treatment for HIV? NextSpirulina for Bad Breath – Does it work? I had no idea that spirulina had so many uses. First it is great to help with allergies and now it is great to help improve eye sight. Crazy stuff. I still have perfect eye sight, but they do tend to get tired more easily now that I’m not in my 20’s anymore. I never thought of taking any supplements to help strengthen them. Spirulina looks like a great choice and the Hawaiian brand looks like a real quality source. Thanks for the information and the recommendation. Thank you for such an informative post. I had no idea how many benefits Spirulina provided. I’ve been wearing glasses for 30 years now. Maybe this is the answer for better eye health!